Creating games and other software for the ZX81 and ZX Spectrum, developer Psion Software had an intimate relationship with Sinclair Research. Founded in 1980, the companies name is an acronym for Potter Scientific Instruments after the company’s founder David Potter. Fred Milgrom — director of Melbourne House publishing and Beam Software — established a relationship with Psion in the 1980s leading to Psion’s name appearing on Beam employee’s William Tang’s “Horace” games. 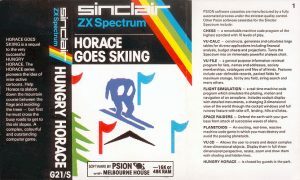 The Australian-developed “Horace” games were packaged by Sinclair Research with the purchase of the ZX Spectrum computer. Psion went on to develop business software for the Sinclair QL including word and database programs, “Quill” (1984), “Archive”(1984), “Abacus”(1984) and “Easel”(1984) that were later ported to MS-DOS. In 1984, Psion moved also into the development of hand held computing launching the Psion Organizer. Psion is connected to the genesis of the smart phone. Its operating system EPOC — created in 1987 to run on their organizers — eventually evolved into Project Protea, which in 1997 became the basis of Symbian and the founding of Symbian Ltd in conjunction with Nokia, Ericsson and Motorola.